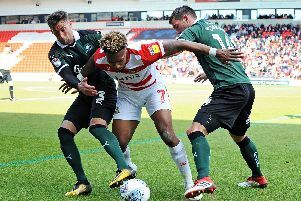 Alex Kiwomya has promised that he has lost none of his pace after bursting back onto the scene with Doncaster Rovers. The Sheffield-born forward is pushing for his first start of the season at Walsall tonight following his long-awaited return to action. The 21-year-old has given a glimpse of what he has to offer in substitute appearances against Portsmouth and Charlton Athletic. He was diagnosed with rare autoimmune disorder Guillain-Barre shortly after arriving at the club from Chelsea in the summer and feared he may never play again. Upon returning to training, he also worried how the condition might affect his best asset - but he has laid those fears to rest. “I thought I might have lost a bit, to be fair,” said Kiwomya. Kiwomya came on to an excellent reception from Rovers fans at Fratton Park and then again at the Keepmoat Stadium on Saturday. “It was an amazing feeling coming on at Portsmouth,” he said. “All the fans were cheering and it just made me even happier.